Vitamin B12 is not made by plants or animals but by microbes that blanket the earth. In today’s sanitized, modern world, the water supply is commonly chlorinated to kill off any bacteria. So, while we don’t get much B12 in the water anymore, we don’t get much cholera, either, which is a good thing! 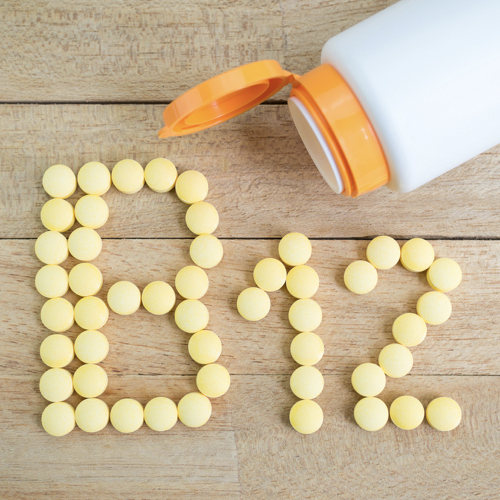 A regular, reliable source of vitamin B12 is critical for anyone eating a plant-based diet. 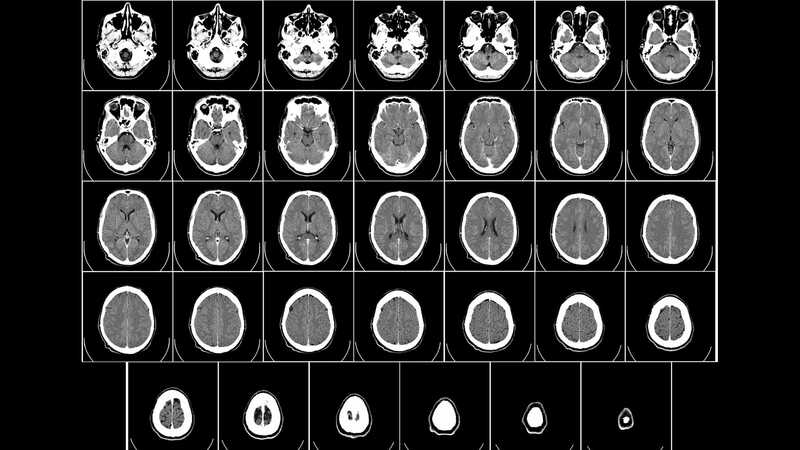 Though deficiency for those starting out with adequate stores may take years to develop, the results of B12 deficiency can be devastating, with cases reported of paralysis, psychosis, blindness, and even death. Newborn infants of mothers who eat a plant-based diet and who fail to supplement may develop deficiency much more rapidly with disastrous results. Getting enough vitamin B12 is absolutely nonnegotiable for those centering their diets around plant-based foods. For adults under age 65, the easiest way to get B12 is to take at least one 2,500 mcg supplement each week or a daily dose of 250 mcg. Note that these doses are specific to cyanocobalamin, the preferred supplemental form of vitamin B12, as there is insufficient evidence to support the efficacy of the other forms, like methylcobalamin. As we age, our ability to absorb vitamin B12 may decline. For those over 65 who eat plant-based diets, the supplementation should probably be increased up to 1,000 mcg of cyanocobalamin each day. 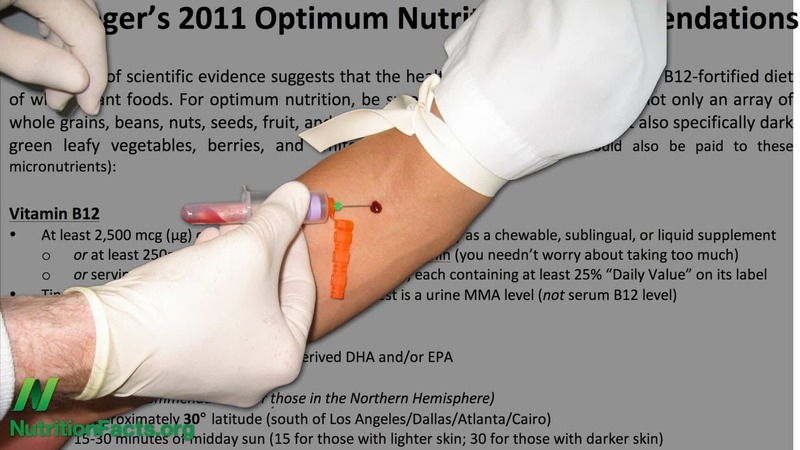 Instead of taking B12 supplements, it is possible to get sufficient amounts from B12-fortified foods, but we would have to eat three servings a day of foods each providing at least 25 percent of the Daily Value (on the Nutrition Facts label), with each serving eaten at least four to six hours after the last. 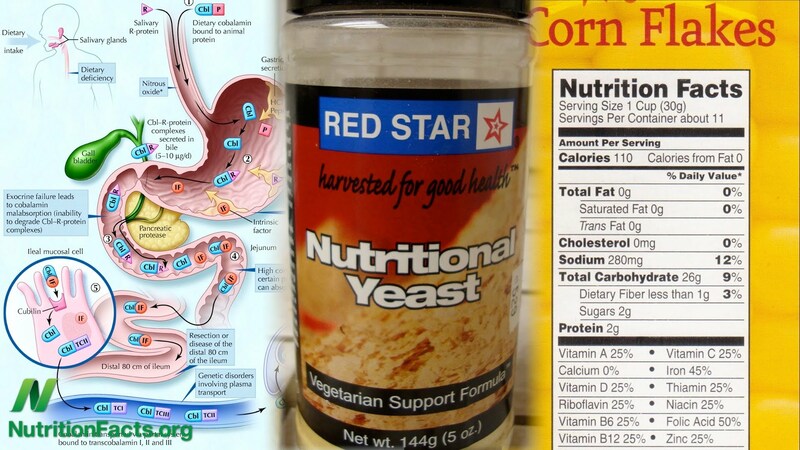 For B12-fortified nutritional yeast, for example, two teaspoons three times a day would suffice. For most of us, though, it would probably be cheaper and more convenient to just take a supplement. Our fellow great apes get all the B12 they need eating bugs, dirt, and feces, but I’d suggest supplements instead!